With temperatures soaring its finally time to hit the beach and feel that cool ocean breeze on your skin. 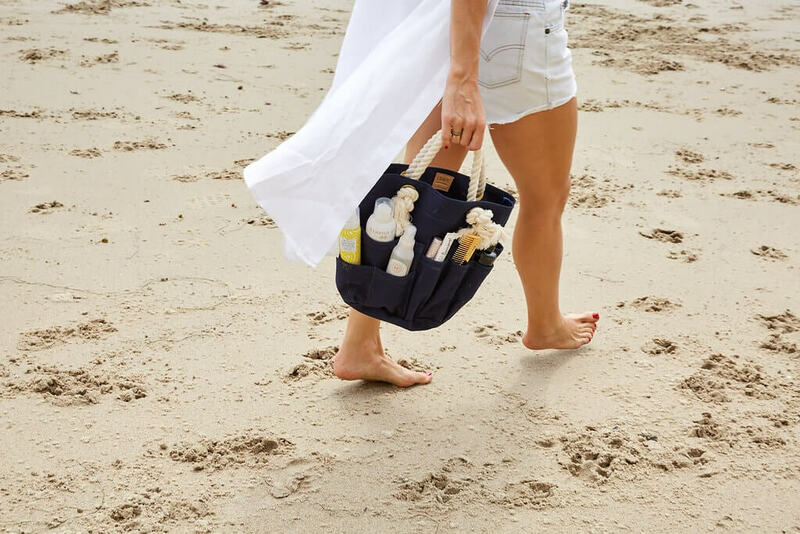 While chilling on the sand is meant to be relaxing, it can be stressful to remember all of the bits and pieces you need to bring along to make the most of your beach-based days and occasions. 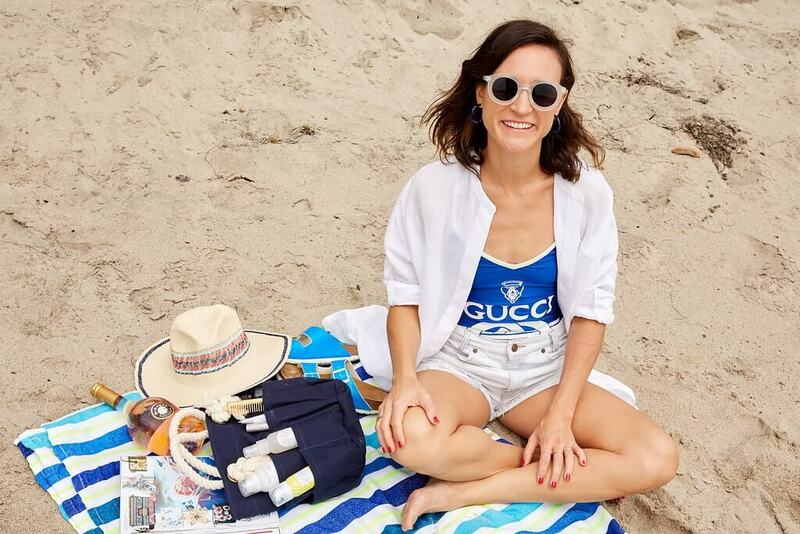 We know you won’t forget to pack a classy swimsuit and a big pair of sunglasses, but it’s important not to forget those little extras that make all of the difference. From fun hats to practical and stylish beach bags, the devil is in the detail. Ready for some fun in the sun? 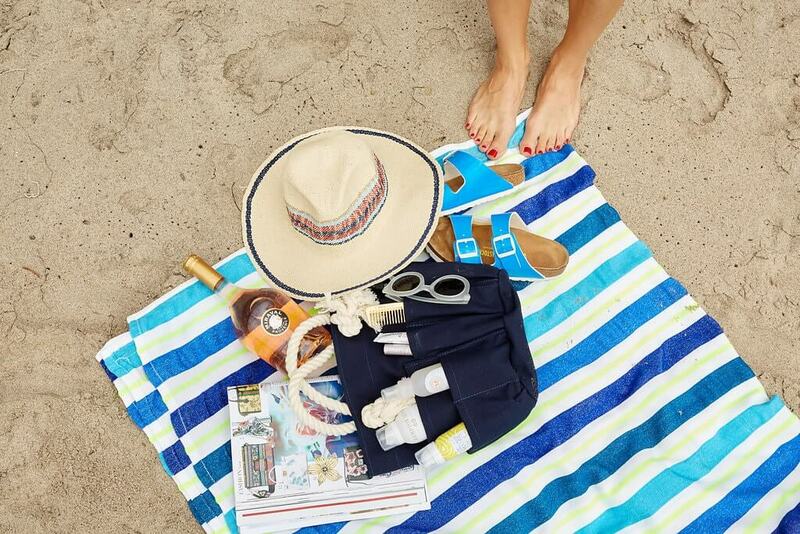 We’ve put together the perfect accouterments for the ultimate beach day this summer. A summer hat is essential for your beach day. Bucket, straw, fedora, cap, baker boy… we want the lot. We love a Panama hat style with a dimpled crown and flexible brim, helping block out the sun in 70’s style. 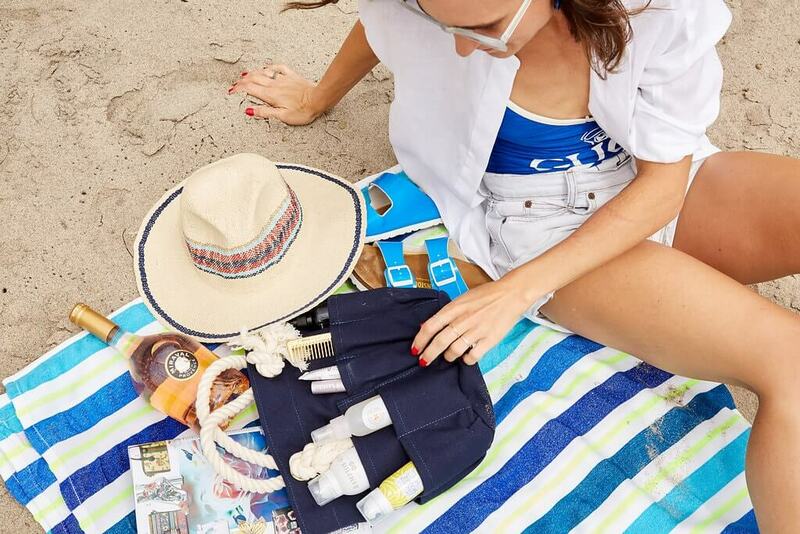 When it comes to beach bags, we love Clare V’s canvas bags. Super stylish and functional, they are the perfect weight and size for a day at the beach. They have introduced a new tote bag, called L’Eté D’Awesome (translation: ‘the summer of awesome’) that makes use of Summer colors, reds and blues, and a frayed rope handle. The beauty of wearing shorts is their versatility, all you need to is change your choice of top. A pair of little shorts can look equally as fantastic with a bikini top, crop top, stretch tee or matching top, so you get several beach outfits for the price of one. We’ve gone with a pair of white shorts and a matching long white shirt that is one of the cutest coverup ideas to wear over a bright bikini. Daily SPF is one of the most important things you can do for your skin. No moisturizer or miracle serum is as powerful as basic sun protection. So, this beach day essential could be better described as an everyday essential! SuperGoop uses clean ingredients that are oxybenzone, paraben and cruelty-free, making it safe sun and skin care. If summer were a glass, it’d definitely come in the form of rosé wine. It’s the quintessential summer drink and has become a summertime staple, thanks to its thirst-quenching capabilities. We’ve gone with a bottle of Miraval from southern France, a bright and elegant rosé with a zesty and refreshing orange-peel finish. Now, you are certainly going to need somewhere to recline in between dips in the ocean. Protect yourself from getting sand where the sun doesn’t shine by bringing along a big beach blanket or towel. We’re suckers for a good stripe. Bright colors are also good for finding your spot when that tide brings you down the shore a bit. There is one more thing that will make your beach day complete and that is some good reading material. Don’t forget to pack that juicy beach read. 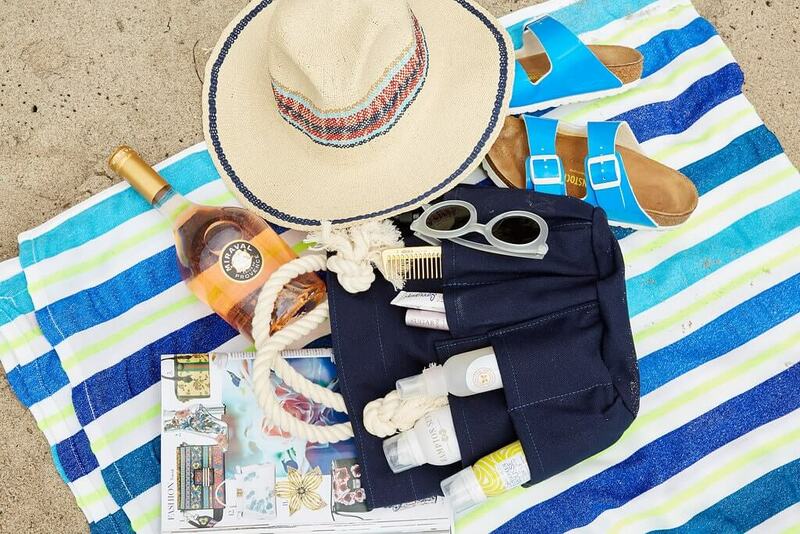 With that and a glass of rosé in hand, you’re all set for a long day at the beach. Don’t forget to reapply that SPF and be safe!